Yesterday, November 23rd had a lot of famous battles take place. In 1248, the troops led by King Ferdinand III or Castile completed the conquest of Seville. The Civil War battle at Chattanooga & Orchard Knob, TN began with the Union General Ulysses Grant facing off against the rebels lead by General Braxton Bragg happened in 1863. A year later was the battle at Ball's Ferry, GA. The battle at Belmont happen during the 2nd Boer War in 1899. In World War II, November 23rd saw it's share of actions. From the Germans invading Kiln in '41 to the Russians surrounding the German 4th and 6th armies at Stalingrad in '42, with the Japanese bombing Port Darwin in Australia on the same day. In 1943, the US take back control of the islands of Tarawa, Gilbert Island and Makin from the Japanese. The city of Strasbourg, France was liberated by the 2nd French Armored Division in 1944. In 2013, it was my LCS's pack war night. And by the end of the battles, I came out a decent victor. Not from the raffles; from the ripping. That's not to say I didn't score a couple raffle items. I won my 2nd t-shirt. It's a pretty lame football shirt, so not even worth a description. The other raffle win was a McFarlane figure of my choice. There wasn't a great selection to pick from, and no White Sox. 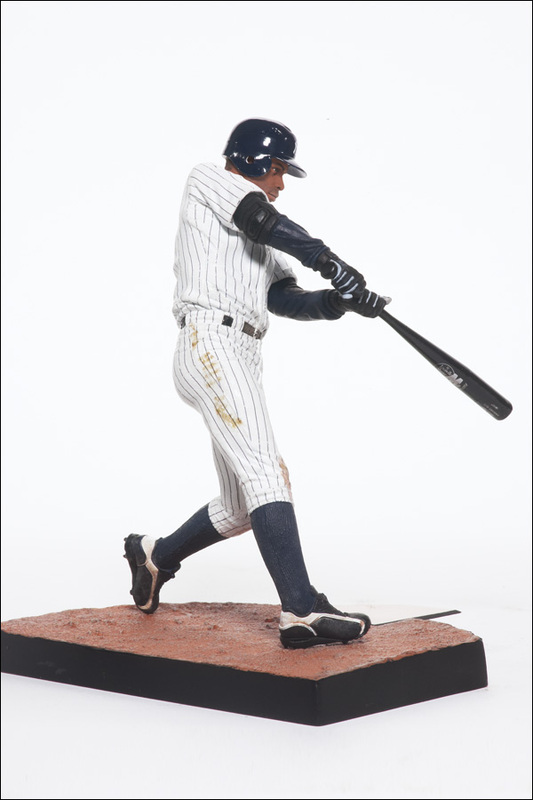 I was leaning towards a Verlander, but settled on Curtis Granderson. I told you - high cuffs always win. 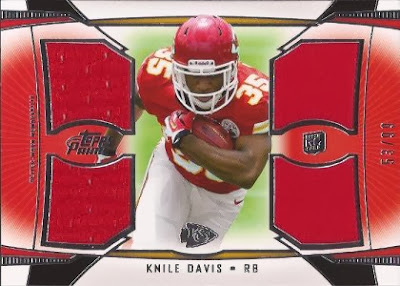 Four swatch card of Knile Davis. #53/99. I almost wonder if the swatches on the right are from pants instead of a jersey. Much different weave. Anyway, all three football hits are available for trade. One of the raffle wins was the box top from Leaf Perfect Game. 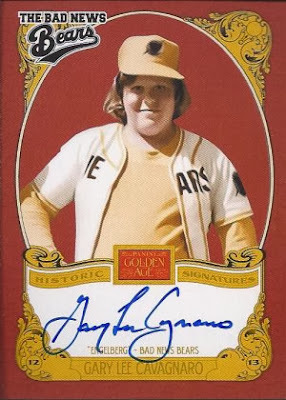 Imagine the time period BEFORE the Bowman prospect cards. That's Leaf Perfect Game. Each pack guarantees a hit, and they were only $8, so I decided to give a pack a try. If I don't know the football guys, .I certainly won't know Jakson Reetz. No worries - Leaf has a bio about him on their website. Jakson is a high schooler heading to Nebraska next year. 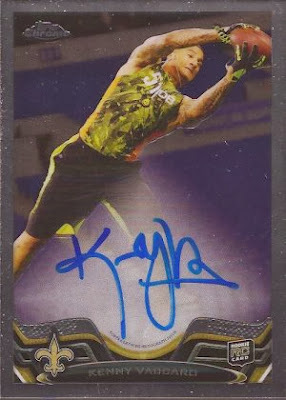 We'll see if this card is worth anything in 10 years. I could do worse. Then again, the card is a jersey dump. 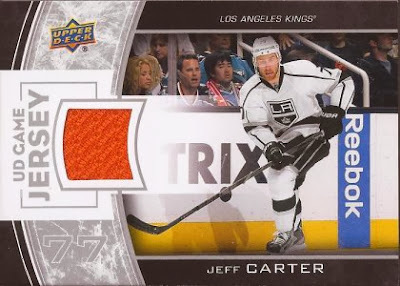 Orange swatch for the Kings? Carter last wore this orange jersey with the Flyers.... 3 years ago! He has since played a a half season with Columbus and the past 18 months with LA. Would it kill them to just throw away the old uniforms? Engleberg! This marks my third autograph out of Golden Age, with the other two being Al Kaline and Steve Stone. Nice autograph by Cavagnaro. According to the innerwebs, he's a sales manager living in Texas with his wife and four kids. 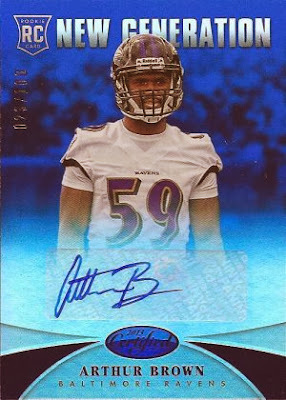 Not too shabby of a pull, and numbered to 50. Granted, she was a bit of a bust in London after all the hype, but she has turned out to be a good pusher in bobsleds, winning gold earlier this year. 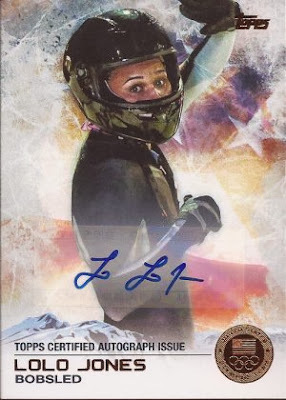 Been a long time since I had such a good output from my LCS pack wars. Let's hope it continues next month.